The Castle Court is a tennis court that appears in Mario Tennis. Its music is similar to the music of Peach's Castle in Super Mario 64. Alex or Nina verse Mario and Peach on this court after beating the Island Open in singles or doubles. It has a normal bounce with normal ball speed. 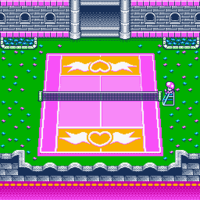 It also has similarities to the Peach's Palace Court from Mario Tennis Open. This page was last edited on March 16, 2018, at 10:04.